Happy Friday-eve to you! I hope you’re looking forward to some labor this weekend. I’ve got some work to do on the homestead and will certainly get in a ride or two. Fall is fast approaching here in the California Alps and then we’ll be dealing with that white stuff so if you can schedule a Sierra adventure now’s the time! Anyway, as I wrote several posts ago, I’d provide some D.R. numbers as soon I could and here they are! As you can see, the numbers are pretty close to last year’s, with the particulary notable exception of first-time riders and that very welcome 75% decline in hospital transports. Promote the 1-pass, 2-pass, 3-pass, 4-pass and 5-pass approach. I.E. There is no shame in finishing just 1, 2 etc. passes. Are some riders were thinking it’s all or nothing? Since there are more events now overall, that is likely having an effect on the D.R. numbers. Riders can find comporable events closer to their homes and so don’t need to travel as far to get that Deathride “bang.” You think? Add timed sections or KOMs. Riders would need transponders of some sort but IMHO this would add some motivation and bragging rights. Perhaps give out medals or trophies, too? Charge more and make it more of a Gran Fondo type of event with mass starts, timed sections or KOMs (see #3 above) and really good food? Host a camp for first timers or inexperienced riders (I mentioned this in that post awhile back)? I talked with quite a few riders on the Friday before the ride and many of them were not aware of things like: starting early (and with lights) if you’re doing all five passes; using a sack-back to carry your cold weather gear for the descents; and bringing your own food so you’re body isn’t shocked by strange input. A gear drop. Full disclosure…We’re (California Alps Cycling, that is) thinking of doing that next year since we have done it for our posse a couple times. What would be a fair price do you think? Do you have any suggestions? Comment on this post or send me an email. Want to check out the D.R. site? Click here. Need some D.R. schwag? Click here. Want some California Alps schwag? Stay tuned for our store grand opening! We’ll have tees (men’s & women’s), stickers, and soon, those jerseys, bibs and wind-vests. 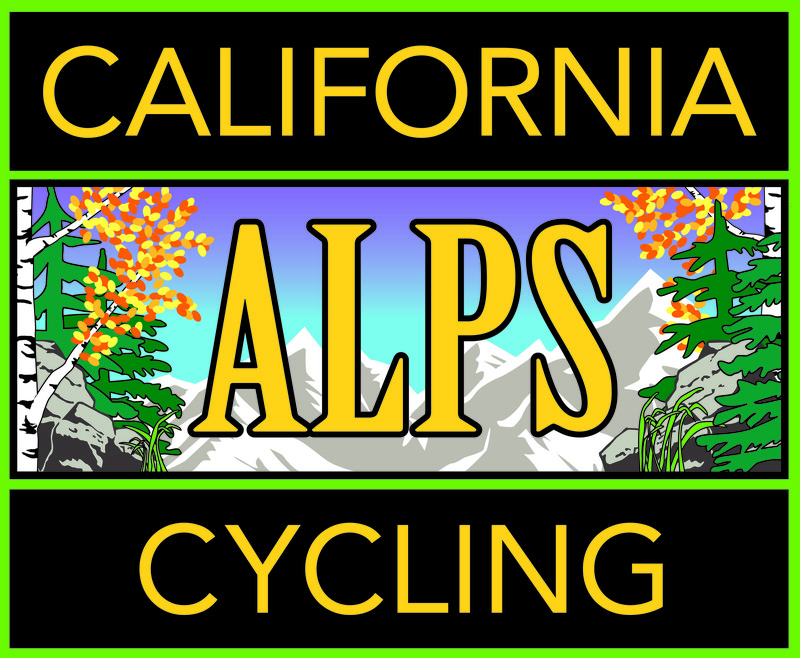 Want to become a member of California Alps Cycling? Click here. See you next year! Deathride on! Happy Tuesday morning Deathriders! I hope you are doing well, not too sore and brimming with fluids now that you’ve had a couple days to rest and recuperate. We hosted eight (8) riders here at California Alps Cycling . That number includes me – I don’t know, can you host yourself? Funny…Five Five-passers and Three three-passers. Go figure! How did you do? Share your comments on this post and let us know! Click here to check out our photo gallery including a bunch of pix I took during the day. By the way, if you’d like to share some of your images, send ’em to me via email. Note: images sent our way are ours to use as we see fit (we won’t photoshop ’em or do anything too crazy, honest). Why are we up so early? We’ve received seven (7) membership requests (thank you!) and as soon as we’re done processing ’em we’ll add you to our CAC membership page. If you’d like to be a member, we’d love to have you join too! For those of you who pre-ordered jerseys, bibs or full kits, we’ll let you know when they’re in and get them shipped your way promptly thereafter. We’ll be getting our merchandise catalog on the site soon. We had quite a few riders interested in our “Let’s Kick Some Passes’ Asses!™” signs and so we plan on offering those for sale as well. Alas, one of them was taken home by someone without permission. Hopefully it brings back good memories and they don’t use it as a frisbee or sumfin. Later in the week, or early next, we’ll get some of that “data that matta” from the Alpine Chamber and CalTrans add publish a post. A big shout out to all of the amazing volunteers, motos, medics, CHP officers, CalTransers and anyone else who pitched in to keep us safe and happy. THANK YOU! Last, but certainly not least, we want to thank you for stopping by our booth and being a part of one of the greatest cycling events on the planet! See you soon. Ride safely!